"What angle should I use for the legs?" and "How far in from the ends of th e seat should the leg assemblies be placed?" The following is a prototype of the bench I'm building. The dimensions are set and the real pieces are already cut. I'm sure that some will have opini ons as to the dimensions of the bench itself, but we're not going backwards. We're going to have to work with what I have. Note: The prototype only has 1 leg assembly and a short stretcher. The bloc k of wood at the far end will obviously be a matching leg assembly. The bench will be 60" long, 14" wide, 18" high, no back. The prototype was built to the same width and height. The seat is 1-1/2" thick. 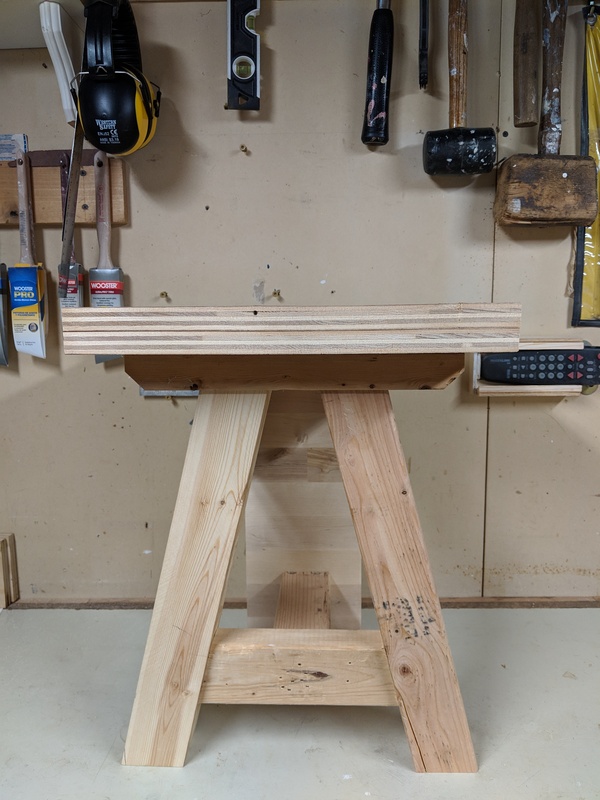 The legs are 2-1/2" square. The stretcher and other miscellaneous supports and braces are 1-1/2" thick and cut to aesthetically pleasing widths. Question 1: Is 12.5° a good angle? I like the look, I just want to be sure that it will be stable enough. Question 2: How far in from the ends of the seat should the leg assemblies be? I'm thinking that centered on 9" in from the end of the 60" bench might work. Obviously, once I decide on the angle and build them, I can pla y around a bit, but I thought I'd toss the question out anyway. Optimum Bench Dog Holes Placement?